So often clients come to me and "say my doc/PT/chiropractor/massage therapist says my _______ muscle is too weak, tight, etc. and that's why I'm in pain." Hate to break it to you, but that is a total myth. Repeat after me. No. Muscle. Functions. By. Itself. You are an amazing being, with your brain controlling how your muscles contract and release as needed. When we move well, we feel well. We move in well orchestrated ways. Those ways are called motor patterns, but sometimes our patterns are fouled up by accidents, surgery, repetitive actions, that kink us up and we end up not feeling like ourselves and moving less than optimally. How we move brings so much into play, from head to toe. To say that one little muscle needs to be stretched or strengthened is not looking at the whole picture. That whole picture, being you. You aren't a machine, so you don't need to fix a "part" of you, i.e. a particular muscle. Instead you need to address how the system is functioning. And what controls how you function and move? Your BRAIN! 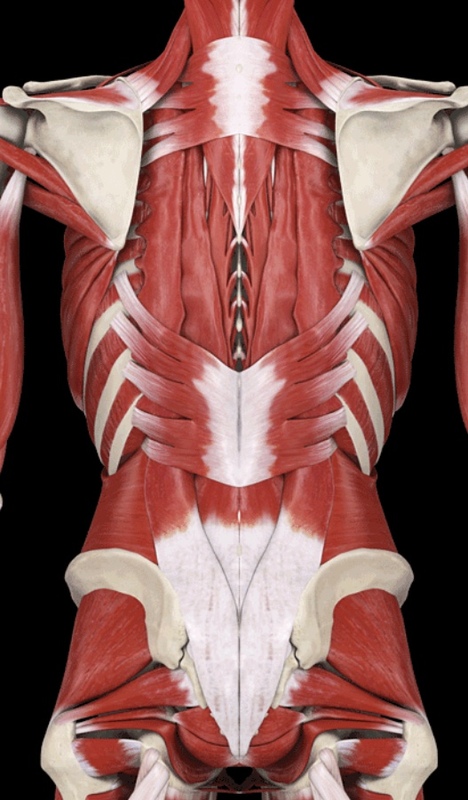 There are seven layers of muscles make up the back of your torso that bend you forward, backward, side ways and into rotation. Take a look at the following images of the muscles that run along the back of your body. 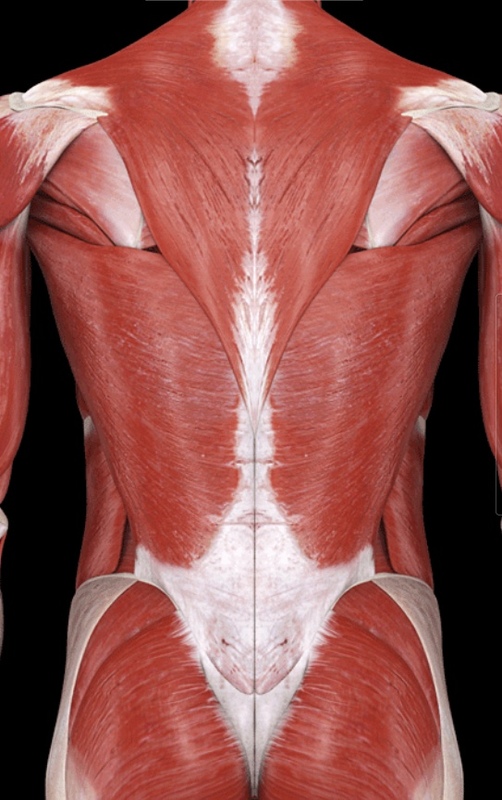 Each one shows layer under layer of muscles along the back of the torso. If one of them is doing something, they are all doing something. Some may contract together. Some muscles will lengthen as the opposing ones shorten (contract). In the same light there would be muscles in other parts of the body which would contract/lengthen. You are whole being, not doll or machine, made of isolated parts. When you are free in your body, you function well as a whole system, a whole process. How you respond to stress in life will influence how your brain and body function. When the brain becomes unaware of how it's controlling the system, things can hurt. 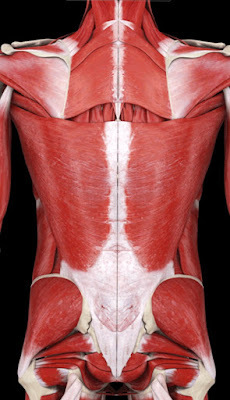 These are the muscle directly under your skin and any subcutaneous fat. 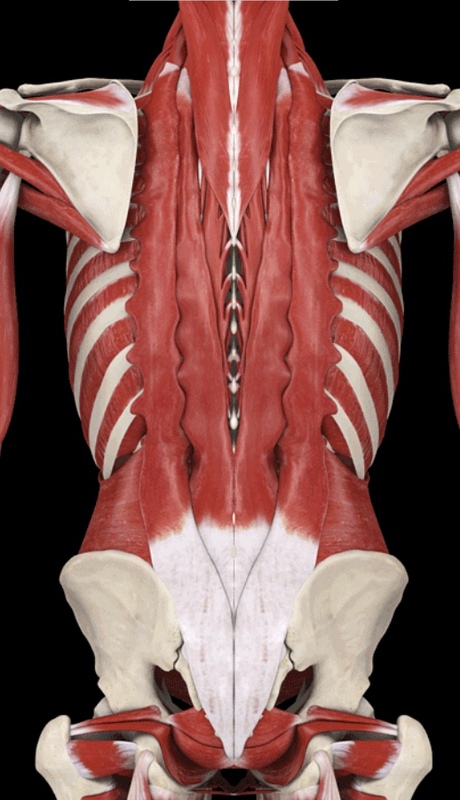 Muscles directly below layer 1. Notice there are even muscles between your ribs. If you are shallow breather, your ribs aren't moving well and you can have shoulder, jaw neck, even hip issues. Notice the long muscles that run from your neck to your sacrum. They help you bend backward and rotate your spine. 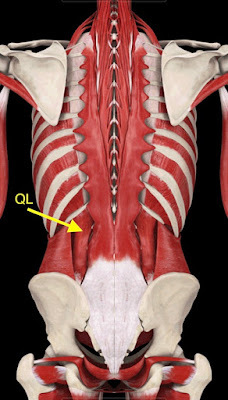 People so tell me about their "tight QL", the quadratus lumborum. The QL is one of the many muscles that help the body bend sideways. 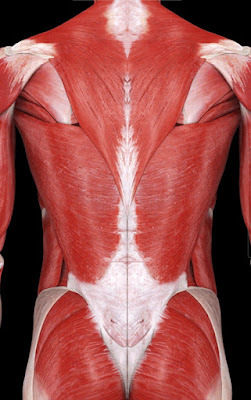 So do the obliques and other muscles of the torso. Perfect example of how no muscle works in isolation. If you've been told you have a shorter leg, your QL as well as muscles between your ribs, along the side of your body can be tight which "hikes" the hip up "shortening" the leg. You most likely don't have a short leg. You have a tight side of your body. 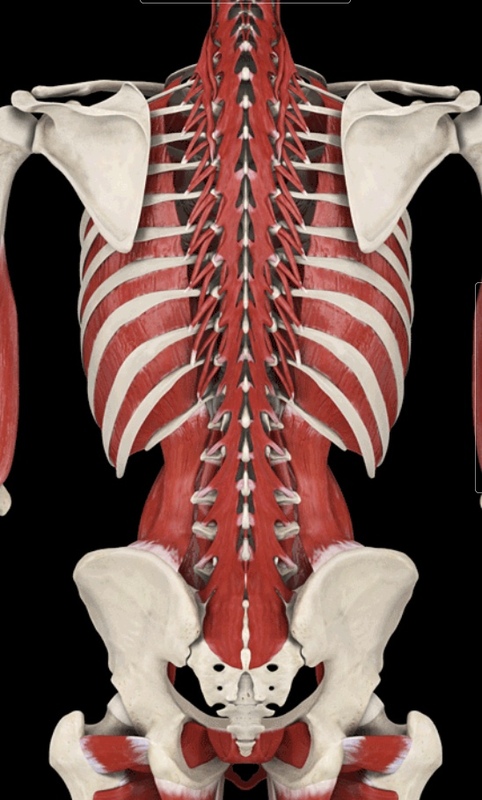 Notice the band of muscles running just along the spine. bending backwards and rotation of the spine. 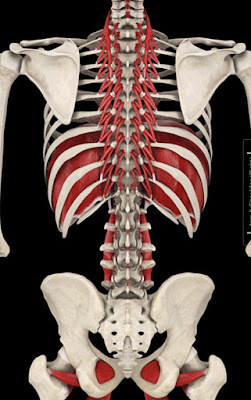 Notice the muscle inside the rib cage. That is your diaphragm. It is a muscle. But we seldom pay attention to its action. When you take a big breath in your diaphragm should expand (contract) downward like a pump, drawing oxygen into your lungs. If you take a big breath in and find you lift your shoulders and breathe towards your collar bones, your diaphragm is not functioning as it was designed to do. Shallow breathing can lead to feeling a bit anxious and exhausted. So what is the point of this simple anatomy lesson? If you've been told you ___________ muscle is too tight, weak, etc, please know it is not working in isolation. You may be told to stretch or strengthen that one area, but that's a laborious, short sighted approach to getting you out of pain and functioning well. But it is the current paradigm, isn't it? It's what I use to think as well. Once I learned about how somatic movements are meant to bring the whole system back to homeostasis, ie, no tension, just relaxed muscles to their natural resting length, it made perfect sense. Clients say the same thing, once they learn the secret. If you want to get out of pain quickly, with enjoyable movements, please consider Clinical Somatic Education (ESE). Clinical Somatics is the intelligent, safe and fast way to relearn how to move well so you can live well. Somatics is not a trendy new "thing". Humans are actually genetically designed to release pent up muscle tension. But in industrialized nations, humans have been encouraged to lead rushed lives, not pay attention to their internal awareness, and as a culture we are told to sit still, "tighten the core," face forward, stand up straight, etc. We have learned how to not move, and therefore be dysfunctional. Somatics on the other hand is a re-education in how to find homeostasis within your system so you can let go of tension and stress without stretching of strengthening your already tight body. Stretching and strengthening do not change motor patterns, the chronic contractions in your muscles, or release them to their resting length. What does? Pandiculations. Pandiculations are gentle contractions, just strong enough to sense tension within your muscles, so the nerve receptors, which have been on autopilot, become aware of what the muscles are doing, and then slowly releasing tension so the receptors relearn to let go and relax muscles. If you've tried everything, but still can't find relief, if you're tired of working so hard but still feel "old," get in touch, sign up for a class or schedule a private session. I work with people online lessons too. 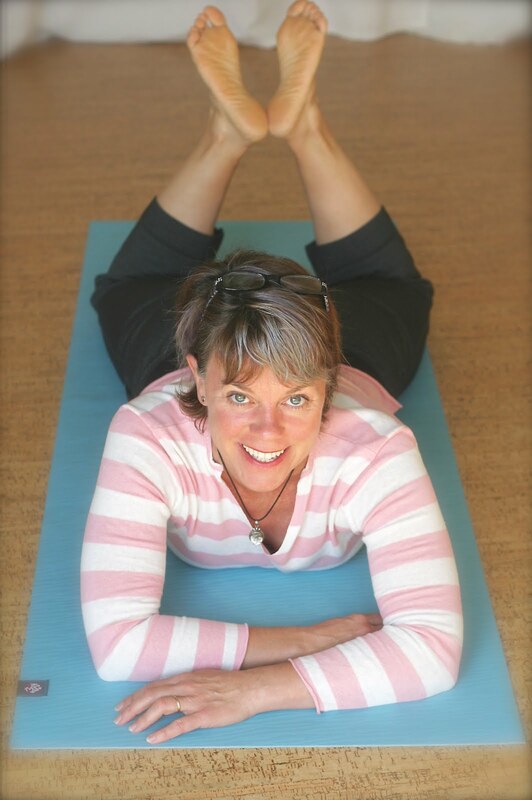 With Somatics you can reclaim freedom in your body and life. The choice is yours.